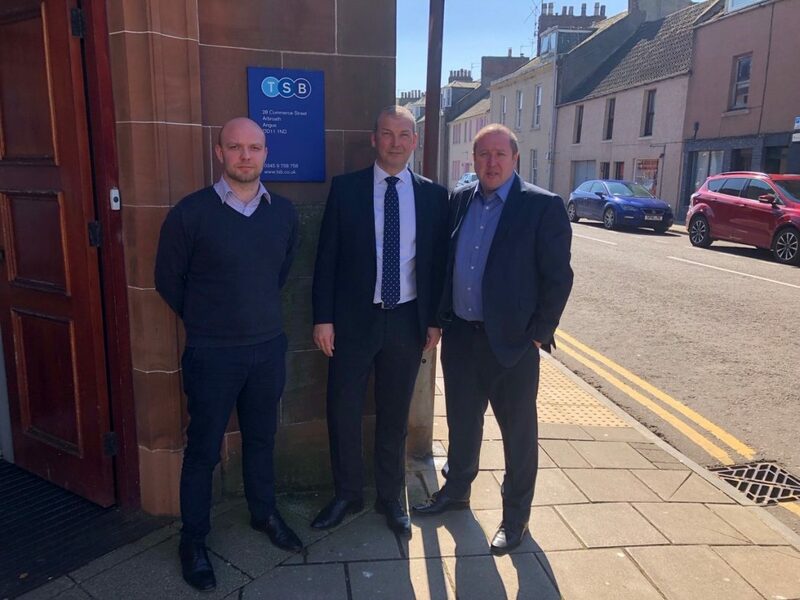 Local politicians Graeme Dey MSP and Councillor Mark McDonald have received a commitment from TSB that opening hours at its Carnoustie branch will be restored either partially or fully, if it can attract more customers. The undertaking was given at a meeting between the Carnoustie elected representatives and TSB Local Area Director Chris Galloway in Arbroath earlier this week. TSB has announced plans to reduce opening hours at the branch. From July it will be open only on Tuesdays and Thursdays, a decision taken because of reduced footfall. Angus South Constituency MSP Graeme Dey commented – “Whilst any reduction in hours is unwelcome, particularly in light of the previous loss of Bank of Scotland and RBS branches from the town, it is a cause of relief that TSB intend to maintain at least some sort of presence in Carnoustie. “And we were pleased to learn that if they were able to substantially increase footfall by attracting new customers then they stand ready to revisit the decision. TSB have also advised the two local representatives that they’ll be increasing staff numbers in the branch for the two days opening in order to avoid queuing.